Use a cloth tape measure and DOUBLE CHECK it against a retractable tape measure for accuracy. Take measurement firmly, but comfortable. This measurement will dictate how snug the pants are in the waist. Measure around the broadest part of the posterior. Take this measurement a little loosely (the tape measure should easily slide back and forth). Measure from the crotch to the desired length. If you have a pair of well fitting pants, measure the inseam of the pants you own. Measure from the crotch seam to the bottom of the cuff. You're going to take this measurement down the side of your body. Measure from where the top of your waistband will sit ("jeans waist" for trousers and 'belly button height" for trews) down the side of your leg to the desired finished length. If you have a pair of trousers that fit you well, you can take the measurement using those (but BE AWARE that if you're ordering high waisted trews, you will need to compensate for the higher waistband compared to normal trousers). Measure around the mid thigh, half way between the crotch and knee. -- Please Select --4'9" 4'10" 4'11" 5' 5'1" 5'2" 5'3" 5'4" 5'5' 5'6" 5'7' 5'8" 5'9" 5'10" 5'11" 6' 6'1" 6'2" 6'3" 6'4" 6'5" 6'6" 6'7" 6'8" 6'9" 6'10"
Suspenders are most often worn with High Waisted Trews. Belts are most commonly worn with Trousers (jeans waist). If you have a wool allergy or sensitive skin, we suggest lining for your trews / trousers. Tartan isn’t just for kilts, naturally. If you’re looking for something you can wear when not kilting up, our Tartan Trews and Trousers are just the thing. Trews are traditional Scottish pants with a design that dates back to the Victorian era. Sometimes also called Fishtail Trews or Military Trews, they are most appropriate for formal wear. Cut narrow and with a very high waistline, they look great with a Prince Charlie jacket and vest, a doublet or even an Argyll jacket and vest. Are these Scottish golf pants? Tartan trousers are cut like modern mens pants. They are ideal for a business casual look or for the weekend. Yes, they are a classic option for golf or any other outdoor activity. 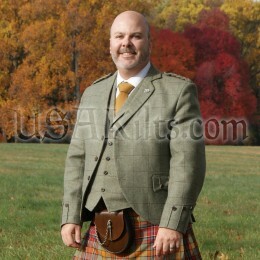 They are often worn with tweeds. Both our Trews and Trousers are hand-made to measure for you by our tailor in Scotland using the tartan of you choice. Please allow eight to ten weeks for delivery. I'm really pleased with how they are made & fit. The tailor matched the tartan lines quite well. The side pockets seem to disappear, they are that well set into the sides of the trews. I chose the Hunting Stewart Tartan by House of Edgar in their muted colors, and the first thing I noticed when I opened the box was the beauty of the Tartan! 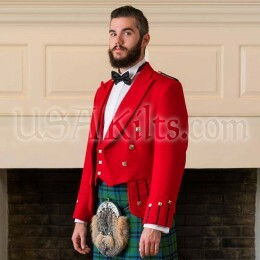 I ordered/bought these from USA Kilts on November 30, 2017. The website said that it would take six to ten weeks.